If you struggle to come up with unique, strong passwords or use the same password for everything then Deadbolt Password Generator is the solution you've been waiting for. Run your mouse over the area below to display your secure password. Or you can see individual characters below. 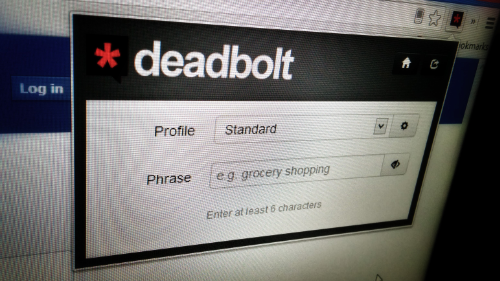 Deadbolt Password Generator is now available as a Chrome Extension allowing you to generate a password without having to leave the page you're on. You'll get all the same functionality but with the added bonus of being able to save custom password profiles, and directly copy passwords to the clipboard. On a very simple level, Deadbolt uses the numeric values of the characters used in your memorable phrase and puts those numbers through a series of calculations. The resulting numbers are then turned into your strong password. The calculations are deliberately inaccurate, losing information along the way to ensure they are irreversible, however the same phrase will always generate the same password. If you'd like a more detailed explanation, Deadbolt is open source and the code is available to view on GitHub. 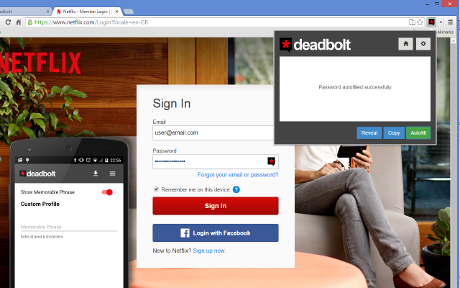 What makes Deadbolt different to a password vault? Unlike 'password vaults', that store all your passwords securely behind a master password, Deadbolt never stores or transmits any personal information whatsoever leaving you fully in control of your data. Since passwords are never stored, they only really exist between the time you generate them, until the time you've used them.